Photo above: Senate President Mike Miller, left, talks to Orioles manager Buck Showalter with former Sen. Sandy Schrader. 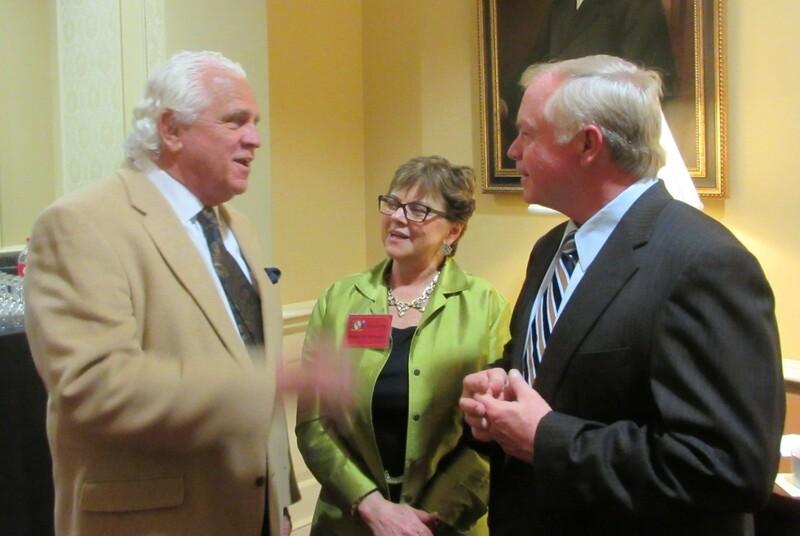 How do you get Orioles manager Buck Showalter to quit sunny Sarasota, Fla., on the first week of spring training to come to Annapolis on a snowy Thursday and address an aging group of senators, ex-senators and their friends? You get longtime Orioles owner Peter Angelos to fly him up on a charter jet, put him in a suit and tie, and make it look like it was the most normal thing in the world for this Mississippi boy to schmooze and pose for pictures with a bunch of pols. Showalter, the American League’s Manager of the Year, was the draw for the annual meeting of Society of Senates Past — an excuse for former and current senators to get together, share a few drinks and swap war stories of the good old days. A run-on hearing upstairs in the Senate Judicial Proceedings Committee on changes to the Police Officer Bill of Rights kept some current senators popping in and out of the dinner. Showalter had few prepared remarks but spent most of 45 minutes answering questions about the kind of real inside baseball that Orioles fans eat up. Despite his stern demeanor in the dugout, the manager has a casual dry humor that had the crowd laughing and applauding. Showalter explained why Orioles outfielder Adam Jones wasn’t with him as originally planned. Jones was at the birth of his first child. “We’ve got the most fertile team in baseball,” Showalter said, observing that the team lost two games last year due to the absence of players for childbirth. He told of a calendar on the clubhouse wall showing the winter months that they were “allowed” to have children, and the months they should aim to conceive those children. “Do the arithmetic,” said Showalter. Showalter’s remarks were all over the ballpark with no particular theme. “We spend more money on food preparation than any team in baseball,” he bragged. This kept the team healthier and leaner than others. Del. Sandy Rosenberg, a rabid Orioles fan who participates in the team’s annual Dream Week for Major League wannabes (he’s a catcher), asked Showalter who his role model as a manager was. “My role model is my mom and dad,” said Showalter, who also had been manager of the New York Yankees and the Texas Rangers. He said in assessing players he’d just as soon meet their parents as seeing their playing records. “I love to beat the Yankees,” Showalter said, music to the ears of any Orioles fan. He describes how he tries to psych out the high-budget team when the Orioles play at the House that Ruth Built in the Bronx. “It’s a short distance between the penthouse and the outhouse,” he said, describing his attention to detail and the attitude of his players. “There’s an excuse around every corner” when you lose. Showalter’s appearance was the brainchild of former Howard County Sen. Sandy Schrader, this year’s president of the Society of Senates Past. Senate President Mike Miller and lobbyist Gerry Evans, who counts Angelos among his clients, helped engineer the deal and the Orioles owner himself showed up still basking in the afterglow of the team’s first post-season showing in many years. Former Gov. Harry Hughes, an ex-senator from the Eastern Shore and reportedly once offered a contract to pitch for the Yankees; former Lt. Gov. Mickey Steinberg from Baltimore County, a former Senate president who just retired from a Rifkin law firm; former Budget & Taxation Chairman Larry Levitan of Montgomery County, who has told MarylandReporter.com this will be his last year lobbying from the same firm; former Baltimore City Sen. Jack Lapides, sometimes referred to as the conscience of the legislature for his work on ethics; former Republican Sen. Jervis Finney, Gov. Bob Ehrlich’s general counsel and the former U.S. attorney who prosecuted Mandel four decades ago; and Sen. Tim Ferguson of Carroll and Frederick counties.